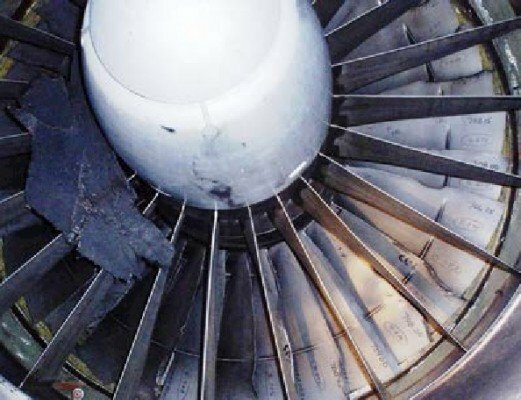 The Austrian Civil Aviation Safety Investigation Authority released their investigation report regarding to a serious incident in 2008 when an MD-88 carried out an emergency landing at Vienna, Austria following engine failure due to foreign object damage. On July 31, 2008, a McDonnell Douglas MD-88 passenger plane operated by Iberia, took off from the Vienna Schwechat airport at 19:34 local time. The airplane was operating flught IB-3575 to Madrid, Spain with 116 passengers and six crew members on board. During the take-off run immediately before becoming airborne, the left engine experienced loss of power and vibration. The pilots retracted the landing gear, declared an emergency to air traffic control and started to turn downwind towards runway 29 with the intention of landing and climbed to 2000 ft MSL. A burning smell was detected in the cockpit but no smoke was seen and no fire alarm was triggered. The pilots wanted to perform a precautionary landing on runway 29 with a flight mass above the normal permitted value and on downwind they worked through the checklists for “Engine fire or severe damage or separation” and “Emergency return to the field”, during which the left engine was shut down. They started the APU and switched on the connected power generator and hydraulic pump. The expected “landing gear extended and locked” indicator did not appear after extending the landing gear. The pilots then circled and worked through the “Abnormal gear indication with the handle down” checklist, including actuation of the emergency landing gear extension mechanism. However, the “Landing gear down and locked” indication for the left main landing gear remained off. The pilots then decided not to land and about 8 minutes after take-off they conducted a low overflight over Vienna-Schwechat Airport at about 500 ft AGL to allow the air traffic controllers in the control tower to check the left landing gear. The pilots were informed that the left landing gear was extended. They then climbed to 5000 ft. In the meantime, the airport operations manager inspected runway 29 and found parts of a tyre and a part of a water deflector. Because of the missing locking indication, the pilots decided to inspect the locking mechanism of the main landing gears with a periscope in the passenger cabin of the aircraft. However, the First Officer, who conducted the inspection, could not obtain any information, because the field of vision was obscured by dirt. Because the pilots wanted to have the information regarding the main landing gear verified again, 21 minutes after take-off they flew over the airport a second time at about 400 ft AGL, which gave them the same information as before. The pilots then climbed again south-east of the airport to about 5000 ft to burn more fuel and prepared for landing by working through the “Landing with unsafe landing gear and possible evacuation of the aircraft” checklist. Once the flight mass had been reduced below the normal allowable landing mass, the pilots decided to land before dark, and decided to land on runway 34, because it was longer than runway 29 and had fewer obstacles on the left side. They were worried that the left landing gear could collapse and requested the presence of the airport fire brigade and a foam carpet, which however was not provided. One hour and 16 minutes after take-off the aircraft landed smoothly on runway 34 at 20:50. During the landing, as a result of the actuation of the emergency extension mechanism, the inboard doors of the main landing gear scraped the surface of the runway and caused a shower of sparks. The aircraft left the runway under its own power and stopped at exit 32, where the passengers could exit by stairs. The pilots, crew and passengers were uninjured. The aircraft was seriously damaged. – Disconnection of the electrical components of the proximity switch of the left main landing gear indicator in the left-hand main landing gear well by foreign parts. – Penetration of foreign parts into the left-hand engine. – Lack of clarity from the company about the additional maintenance work performed in the area of the valve stem when the tyre was replaced. – Use of a porous O-ring for the valve stem on rim 2. – Inadequate greasing of the O-ring of the valve stem on rim 2. – The daily check of tyre 2 on the day of the incident did not detect any pressure drop, as it can be assumed that the tyre pressure was not checked at all. – Signs of the tread becoming detached on tyre 2 were not recognised during the preflight checks. – Incorrect tightening torque used when fastening the valve stem to rim 2 when the tyre was replaced on 11 .7.2008.